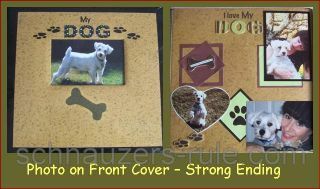 A dog scrapbook or memory album is a great way to show off your lovable Miniature Schnauzer to family and friends. And it’s not only easy to do it’s a fun dog craft project for kids and just the whole family! Be sure and start this project as soon as possible! This is especially true if your Miniature Schnauzer is still a puppy. They grow up super fast and you don't want to look back and wish you had done a better job of capturing all these precious moments of his/her life. Take pictures, pictures, and more pictures. Puppies do the cutest things all the time so be ready at all times. If you don't have your camera with you, use your camera phone. Just get the shot! Before you actually make the album, you need to start collecting or saving little items that say something about your dog. So grab some type of container like an empty shoe box for example. Label it, perhaps with your dog's name. And constantly add trinkets to it. This way when you want to create another page in your scrapbook you'll have items ready to go. So what kind of items do you put in your box? 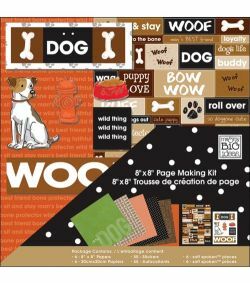 Check out these dog-themed kits and crafts on Amazon and start building your memory book. *dog craft project tip: You can create a print of your Mini Schnauzer's paw prints by using washable non-toxic finger-paint. Simply sponge some of the paint on the bottom of your dog's pads. Then have your schnauzer walk across a piece of construction paper or doily. Letting your dog walk on the paper or fabric will bring about a better impression. If you try to push your dog's paw down, you may cause him pain and the results will likely be smeared. 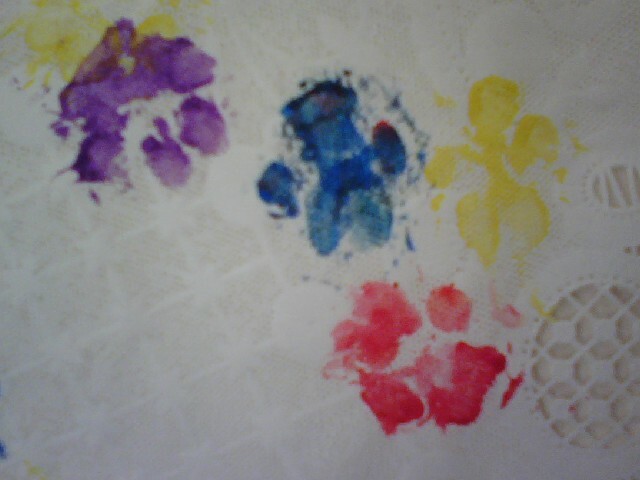 Once you get the prints you want, simply rinse the remaining paint off your dog's paws. As mentioned earlier, take lots and lots of photos of your Miniature Schnauzer. 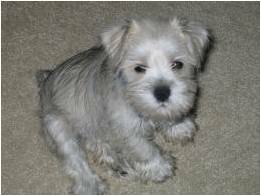 You will want to especially get lots of pictures of your Miniature Schnauzer puppy’s 1st year. They grow up so fast! Include vacation photos, outdoor play time photos, photos of your Miniature Schnauzer's 1st birthday and your Schnauzer's 1st Christmas. Even get pictures of your Miniature Schnauzer with his vet or learning a dog trick, having his 1st bath or a photos of grooming sessions and include them in your Miniature Schnauzer's dog scrapbook. And your dog scrapbook will really 'bark' if you use 'action shots' or ones that tell a story. These type of pictures are way more entertaining than just posed photos of your Miniature Schnauzer. Read more on how to take great Miniature Schnauzer Pictures here! The supplies list below is meant as a guide only. You may use more or less materials. crafty tip: Use acid free materials to ensure your dog album lasts for years to come! Okay, you have enough dog items and supplies to start putting together your dog's memory album. You can arrange it any way you like. How about a chronological album? OR a theme based album? Create interesting shapes of your photos. Notice in the pictures how some photos have been cut to include just a silhouette, or have been cut with decorative edges using art scissors, or cut into different shapes like a heart that frames the image. Group photos together on a page so they tell a story. Take lots of photos of events: at a dog party, at the dog groomer, or perhaps of your Miniature Schnauzer during an agility event... and then group your pictures so they describe the day. Be sure to use colorful background pages, action shots, and include funny quotes to make your album even more entertaining. You can also add stickers and other embellishments to really make your pages pop! Include stories written about your Miniature Schnauzer or write a short story about your dog yourself. 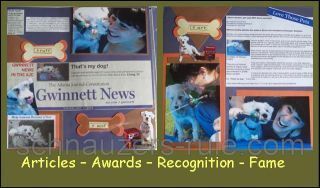 Also, be sure to add awards and/or certificates your Schnauzer may have received. 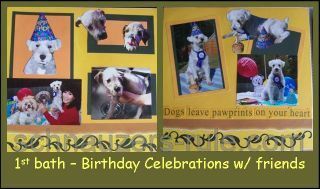 After all, your dog scrapbook is your Miniature Schnauzer's brag book too! 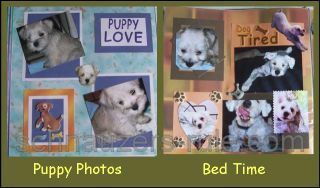 One last tip: Try and keep your dog scrapbook pages easy to read by not overcrowding the pages. 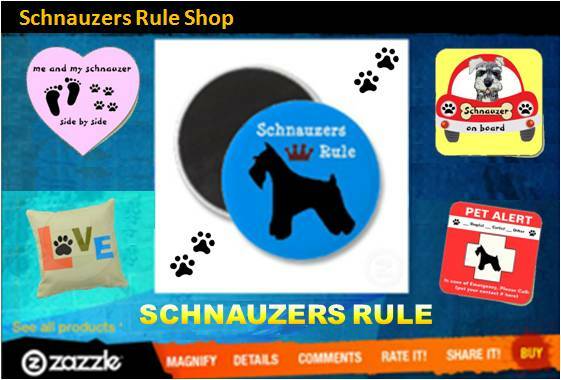 In the end, you've created a true keepsake you'll treasure forever and one that celebrates your Miniature Schnauzer’s life. Got a craft project or idea you'd like to share with us? We'd love to here it! Just fill out the Dog Crafts & Pet Projects form. And be sure and check out other fun dog craft projects, (see right column Doggy Fun) including yummy homemade dog treats, making your very own dog toys, dog beds, and lots more!